Sometimes you don’t even have to travel to another country to get a good sense of what it would be like living there. I still imagine a vacation in Germany where everyone is yelling Gewürztraminer [ɡəˈvʏɐtstʁaˈmiːnɐ] to each other. And as an aside, does anyone find [ɡəˈvʏɐtstʁaˈmiːnɐ] helpful in learning how to pronounce this word? In the English speaking world everyone knows that cats say “meow” when they decide that it’s time to speak to somebody. However, in Japan cats appearantly say “nyan, nyan” to each other and to people who are willing to listen. 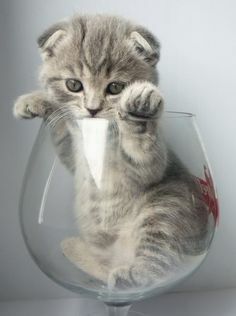 And all evidence suggests that there are people ready to not only listen – but to pour the little kitty a glass of wine and sit down together and enjoy each other’s company. 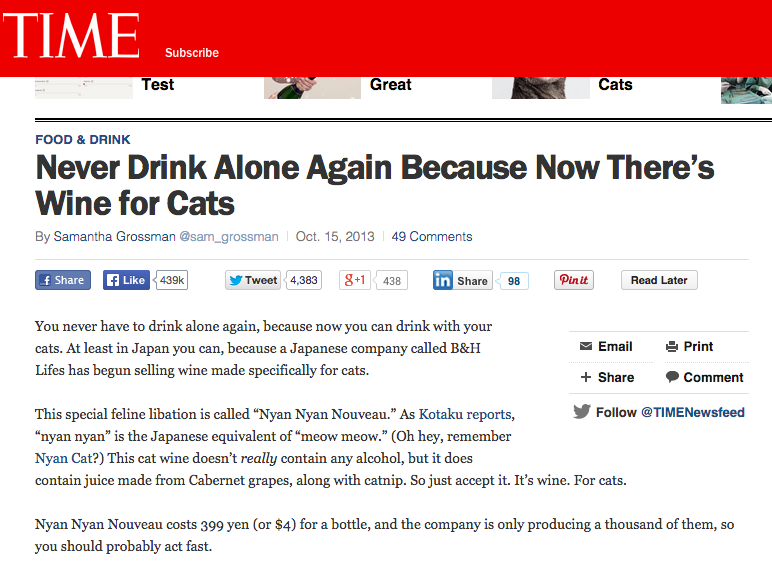 Yes, have a glass of wine with your cat because a company called B&H Lifes is producing a wine made specifically for cats called Nyan Nyan Nouveau [click for full-size article]. The wine is non-alcoholic – because ain’t nobody wants to see a cat drunk – and it seems like a sweet idea to share a drink with your pet. For those of you who want a more traditional wine to drink and think of your cat [and i don’t mean for you to let your cat drink this wine] how about a play on words and your try the Chateau Hauchat [very loosely translated for the purposes of this wine blog as “there cat”] – a lovely Bordeaux red wine from this past Vintages release [Vintages 123489, $15.95]. Featuring a sublte cedar and tobacco undertones that give it the character of a $30 fine wine combined with plum and with fresh fruit overtones it is a steal at this price. Meow. This entry was posted on Sunday, January 11th, 2015 at 6:26 pm	and tagged with cats, Chateau Hauchat, Japan, Meow, Nyan, Time magazine and posted in LCBO Quick Pick list. You can follow any responses to this entry through the RSS 2.0 feed. Chat malin might be worth trying (as an aside, it used to be Chat en Oeuf but they had to change the name! ).